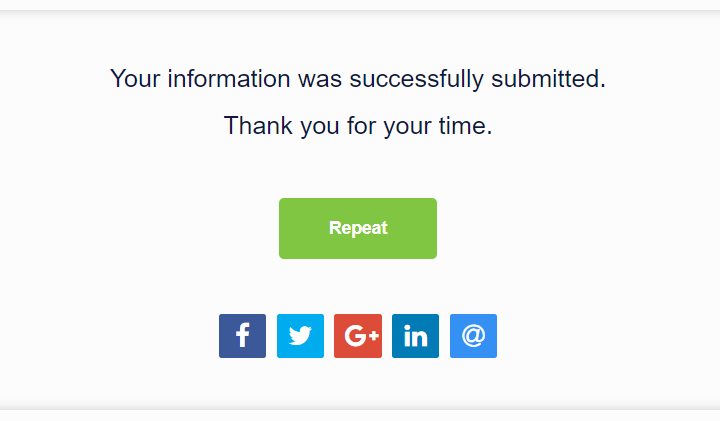 Create interesting End screen on your form, survey or quiz. Thank your respondents, add Social share buttons and more. 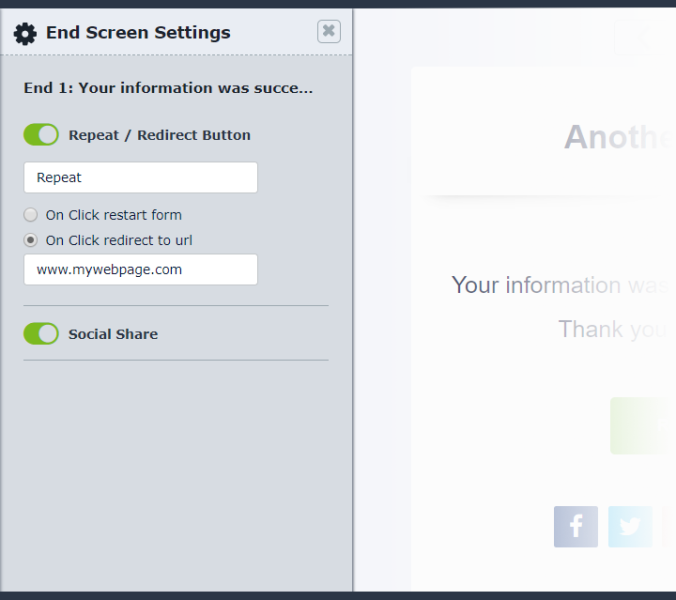 End screen is the screen that appears when your respondent submits their responses to your form, survey, or quiz. It is optional, which means you can add and create it and you do not have to. The End Screen serves to thank your respondents for completing the form, participating in the survey, or to display the results if you have an exam or a quiz. In the End screen settings, you can add a restart button to enable them to respond to your form, survey or quiz question or redirect button to redirect them to your other form, survey or quiz on your site or whatever URL you choose. Additionally, you can also add social share buttons that allow your respondents to share your form, survey or quiz, and so gather more respondents. At the end screen you can enter text, add buttons, and you can also add media, any image, animated GIF, video or audio, and so your form, survey or quiz learn more interesting and visually more beautiful. Adding the End screen is easy with QPoint! Simply click on "Add End screen" in question preview and enter the desired text. Also, you can add more end screens but you can read more about it in the article [LINK: "Add multiple end screens"].